That little pink area is Alsace. Germany is to the right and though it doesn’t show it, Switzerland touches the bottom. Do you know where Alsace is? 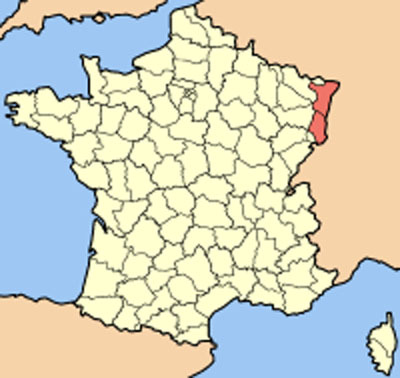 I was just a little girl when I first heard of this northeastern slice of France as the place where my great grandparents came from. The story was, over centuries of wars, that this luscious green land was a treasure swapped back and forth between Germany and France. Even today you’ll sometimes catch people speaking snippets of an old Alsatian dialect that seems to be a mishmash of the two languages, though French is officially and most commonly used. Names of towns are just as likely to sound German as French, and many people have French first names and German surnames. So, I join thousands of Americans who say, damn it! Why didn’t anyone ask Nana exactly WHERE she came from?! I have some very vague information about grandparents on both sides of the family, but I sure wish someone had quizzed the old dears and gotten a few details written down before we lost them. I remember Nana sitting in my grandparents’ sun room watching Indians baseball games on TV and always wearing a dark green visor, I think because of having had cataract surgery (which was a huge deal back then). I’ll be posting this one again so you can see where the various towns are that I’ll write about. For now, look for Ribeauville, up and to the left of Colmar. That’s where we stayed! Fast forward 50+ years and I am a real-life as well as armchair traveler, hooked on reading travel memoirs and watching anything travel-related on TV. I have the latest boxed set of Rick Steves’ Europe through the Back Door DVDs and defer to Rick’s entertaining and practical advice when planning every trip of my own. I’m also an HGTV junkie, recording every episode of House Hunters International because – greedy guts that I am – it’s not enough to imagine merely visiting a country. No, in my fondest dreams, I’m actually LIVING in some charming European village. Specifically, I am living in a tiny flat (with the dogs), just blocks from a train station where I can easily visit MORE charming villages and historic cities at my leisure. This is, perhaps, where I spend a couple months each winter (maybe in the South of France?) since I am not a Florida kind of gal. I return to my sweet home in Ohio before my April birthday, having escaped the worst of winter on the chilly shores of Lake Erie. Sounds good, right? So anyway, one House Hunters International show a few years ago featured a young couple looking for an apartment to rent in Strasbourg (see map). It was adorable! I was so taken with the beauty of this small French city (plus – it was in Nana’s ALSACE! ), that I vowed to visit one day. Yes, I have a dirty mind, but doesn’t Sue’s lunch look vaguely pornographic? 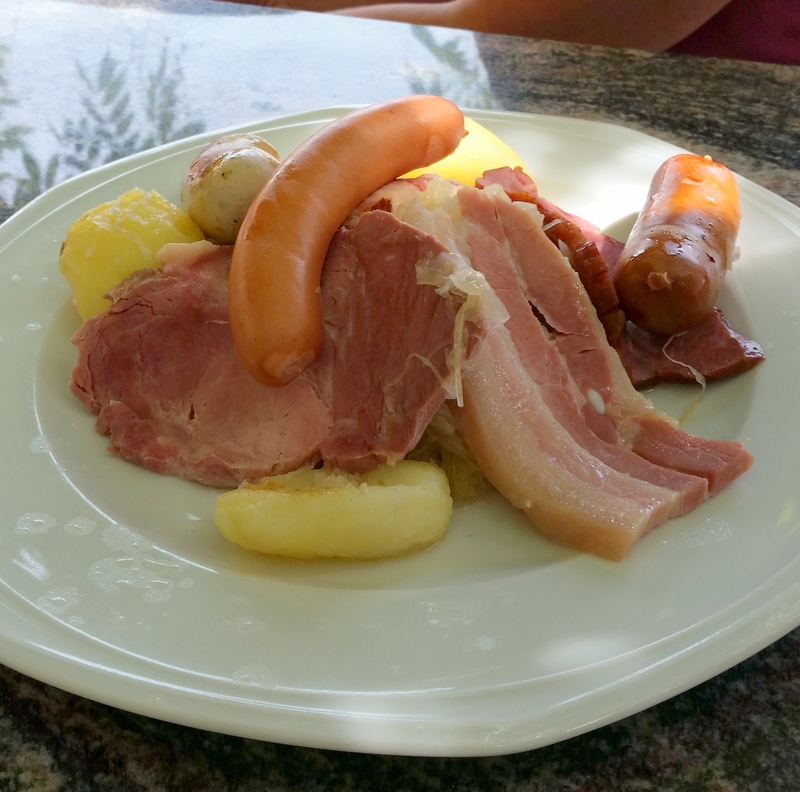 This what you get if you order “choucroute” – sauerkraut, potatoes, sausages, ham and bacon. Then . . . my old friend Sue Brooks was in town visiting family, so we got together for dinner. We started comparing travel stories and discovered that Alsace was on Sue’s must-see list, too. Sue is a registered dietitian and despite being a size two, is an enthusiastic foodie, and wanted to visit to try the choucroute (French sauerkraut), charcuterie (French sausages and weird potted meats and such) and wine. And I (size mind-your-own-business), just wanted to wander around ogling half-timbered houses and window boxes filled with geraniums, eating almond croissants and hearing the melody of French being spoken around me. When it comes right down to it, I’m all about traveling to see pretty things. There. Call me shallow. I don’t care. 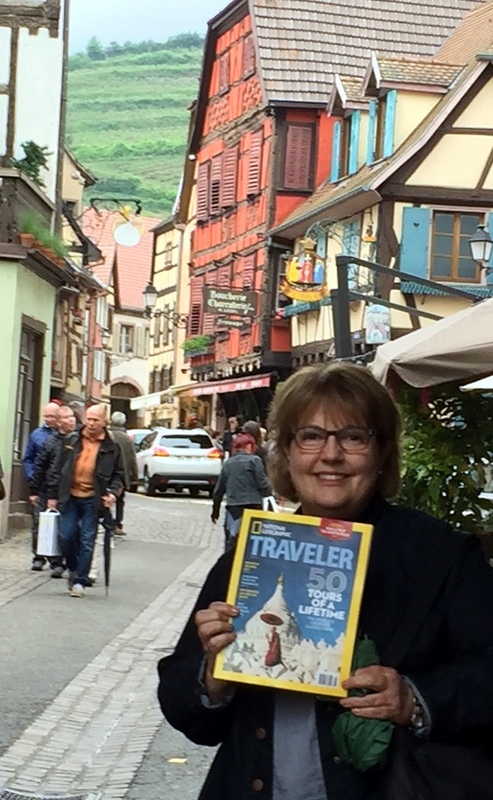 Here I am in Ribeauville, posing with my latest National Geographic Traveler magazine. I have been meaning to send it to the magazine (they asked people to do this). Maybe they will publish mine! I’ll stop here because honestly, I am going to overwhelm you AND me if I keep writing. I had a hard time even getting started because there is so much I want to share with everyone. In the days and weeks ahead, this site is going to be pretty much Everything Alsace, because I have fallen in love with this region of France. A stork! We loved them! 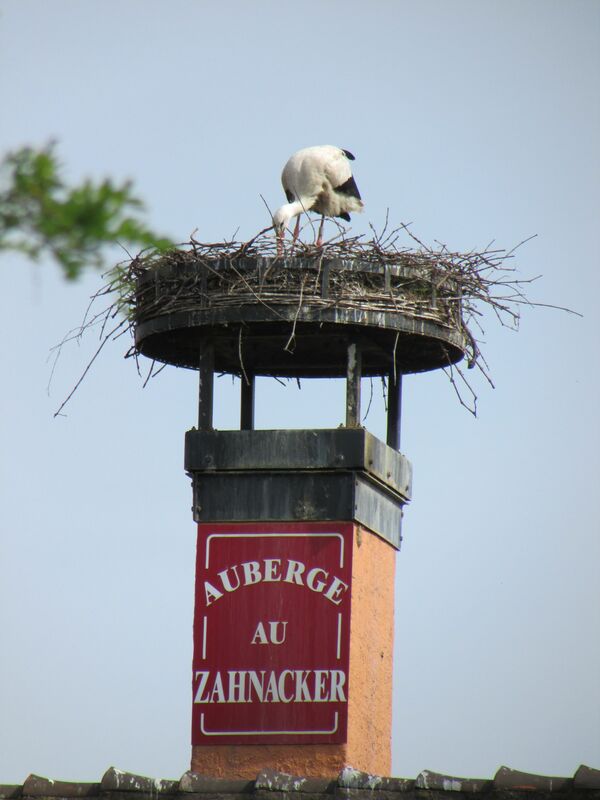 You’ll hear about Stork Stalking, following the Route des Vins as well as the not-to-be-repeated Route des Carpe Frites (that’s fried carp and all I’ll say about that right now is EEEEUW!). We’ll go to towns and villages you never imagined you’d want to visit like Eguisheim and Riquewihr and Ribeauville. We’ll eat pork shank and sausage with sauerkraut and try the region’s white wines. And, yes, you’ll see pictures of window boxes filled with geraniums and castles on hills with vineyards in neat rows marching down the slopes below. For now, I will end with our favorite French farewell, à tout à l’heure! – which means roughly, see you later! This entry was posted in Travel and tagged Alsace, Choucroute, France, Ribeauville, Route des Carpes Frites, Route des Vins, Storks, Strasbourg. Bookmark the permalink.